January 14, 2010 9:28 pm – I want to remind everyone that although it may seem difficult now for your individual efforts to reach the shores of Haiti – you can make a difference through several reliable not for profit organizations. Since May 2009, I have been creating momentum with and through the Haiti Initiative as its Chairwoman. Now, Haiti needs more help than ever. 1. If you are local to Carteret or Onslow counties in North Carolina, you can donate funds directly to UMCOR through Swansboro United Methodist Church. UMCOR has a direct presence and organized effort in Haiti at present. 100% of all funds donated will reach Haiti. 2. You can purchase the organic grocery totes I designed exclusively for the Haiti Initiative through Stop Hunger Now – which have been on sale since fall of 2009. Each $10 tote purchases 40 meals for children in Haiti. 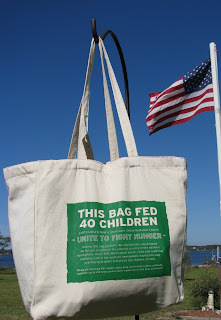 100% of the proceeds from the sale of these bags goes to Stop Hunger Now. 30,000 meals were personally packaged by volunteers through our sponsoring congregation at SUMC. Please contact me directly through this blog to make a purchase. The tote is pictured above. Please catch up on previous blogs by scrolling down, for more information on local NC efforts to help Haiti prior to and since the earthquake. Many thanks to all of you who have already sent donations and pledged your support – either through monetarily or through your time. Come out and support M4M 2010 – Haiti Initiative’s Musicians 4 Missions 2010 at www.Music4Haiti.org. M4M has been planned for several months and now is the time to come out and show your love for Haiti and for music, on March 5, 2010 at SUMC.